I'm thrilled to be here to share my version of the Stained Glass Technique with you today. It is my first contribution to the Stamping Techniques 101 Blog Hop, and I'm very happy to show you how easy this version of the Stained Glass Technique is for beginner stampers, and how much fun for more experienced stampers. 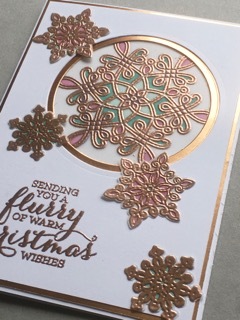 Heat Embossing is always a WOW! no matter how often you do it. 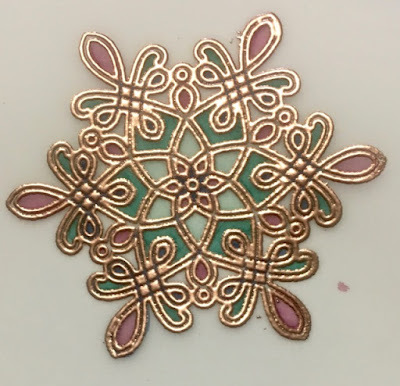 I used the Flurry of Wishes stamp set from the Annual Catalogue (p. 116) and Copper Embossing Powder to create my stained glass. As an added bonus if you live in Australia, the Flurry of Wishes stamp set is currently reduced by 30%. And a close up view of the central motif. You can see the colour peeking through the lines and shapes created by heat embossing the image with Copper Embossing Powder. Dust Vellum with Embossing Buddy, then stamp the large snowflake image and the 2 smaller snowflakes using Versa Mark ink. Remember to use a Pierce Mat under your Vellum! Leave room around the large snowflake . Cover with Copper Embossing Powder and tap from behind to remove excess powder. Working from the back of the Vellum, colour in areas of the snowflake using Stampin' Blends (alcohol ink), to create the Stained Glass effect. Note that you will need to let the first layer of colour dry for a moment and then add more colour to improve the density. Use the Circle Builder Framelits to cut out the opening for the "window". I used the largest circle to cut out the white card and the 2nd largest circle to cut out the Copper Foil Card, thus creating a foil circle around the image. Cut out the 2 smaller snowflakes. Adhere the copper foil card under the Whisper White Thick card ensuring you have an even circle of Copper Foil showing. Next adhere the Vellum to the back of the Copper Foil using Fast Fuse or Snail Adhesive. Stamp the greeting directly onto the card below the cut out circle. Place the smaller snowflakes to balance your composition, adhere them to the card and you are finished. I hope you have enjoyed this card and that you will give heat embossing on Vellum a try. I mentioned using the Alcohol Blends - you can substitute the Stampin' Write Markers but you have to be very careful not to smudge them as they do not dry for a long time! Now it is time to move on to visit Carmen and see her awesome design. Simply select the button below and it will take you there.